Explore Kentucky's many natural wonders. There is no shortage of amazing places to visit in Kentucky. The "Bluegrass State" is home to a myriad of natural wonders, historical treasures and quirky roadside attractions. With so much to see and do in Kentucky, you'll have to plan carefully in order to take it all in. Kentucky's borders are brimming with fabulous travel attractions. From its awe-inspiring national parks, which offer unparallel recreational opportunities, to its diverse cultural attractions, including world-famous Churchill Downs, Kentucky has something for everyone. One trip to this charming southern state and you'll quickly discover that it has much more to offer than just bluegrass music, bourbon and horse racing. Kentucky boasts a rich medley of geological wonders, family-friendly events and amazing architecture. Millions of visitors travel to Daniel Boone National Park each year. 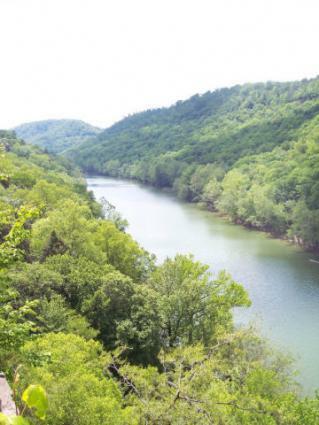 The ecological gem is located in the Appalachian foothills of eastern Kentucky and encompasses more than 700,000 acres of tree-lined ridges, winding ravines and thousands of miles of sandstone cliffs. Cave Run Lake and Laurel River Lake are among the most popular attractions in the park. They provide visitors with breathtaking views and the chance to get up close and personal with wildlife. Daniel Boone National Park is also a haven for hikers. With more than 600 miles of nature trails to explore on foot or on horseback, the park offers a quiet escape from the chaos of everyday life. Mammoth Cave National Park is one of the most recognized cave systems in the world. It is located in south central Kentucky and spans more than 367 miles, making it the world's longest known cave system on the planet. However, the cave system, which features a myriad of vast chambers and a series of complex labyrinths, is not the only reason visitors flock to the park. Mammoth Cave is also home to 52,800 acres of natural beauty. From lazy rivers to lush green rolling hills, you could spend days at the park and cover less than a fraction of its offerings. The short-list of popular park activities includes camping, horseback riding, and hiking. Kentucky is home to 17 state resort parks-more than any other state in the nation. The immaculately groomed recreation areas offer the perfect place to camp, swim, canoe and bike. One of the most visited of Kentucky's resort parks is Cumberland Falls. Known as the "Niagara of the South," the falls forms a 125-foot wide curtain of water that plunges 60 feet into a rocky gorge. No trip to Kentucky is complete without a visit to the legendary Churchill Downs. Located in Louisville, Kentucky, the thoroughbred racetrack is home to the most famous horse race in the world-the Kentucky Derby. The Derby is run on the first Saturday in May and is preceded by a two-week long Kentucky Derby Festival, which includes the largest annual fireworks display in the United States. Churchill Downs is also home to the Kentucky Derby Museum, which is located on the front steps of the historic track. The museum greets more than 200,000 visitors annually and boasts dozens of exhibits on horse racing's impact on Louisville and the rest of the world. With so many incredible places to visit in the "Bluegrass State," you might consider getting help from the Kentucky Department of Tourism. The group provides a litany of maps, brochures and other online resources to help make your trip to Kentucky one you will remember forever.